If you read my post, How Do You Make Nature Study Fun?, you know that today I am offering an opportunity for one of my readers to win their choice of one NaturExplorers eBook. As I shared yesterday, these are one of my favorite resources to use for our nature studies. They provide a lot of fun exploring ideas. Read my review of the Peaceful Ponds eBook. Giveaway ends 3/14/14. Winner will be notified on 3/15/14. 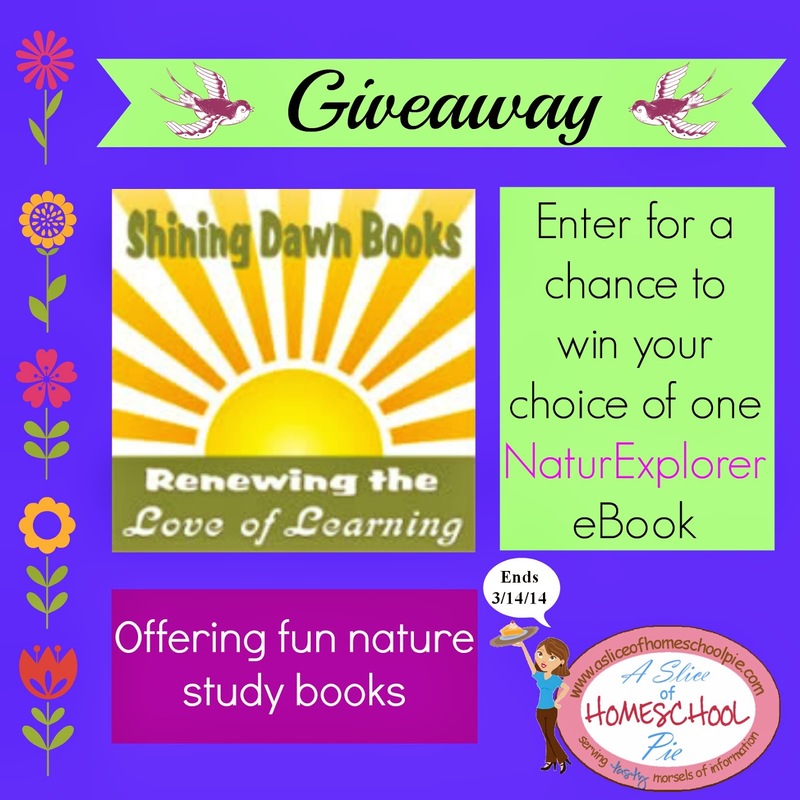 Make sure to share this post with your friends so that they can have a chance to enter this NaturExplorers eBook giveaway, too. Please Pin or Share this post by clicking on the icons below. Make sure you don't miss any of my posts. Become a subscriber by clicking on the Bloglovin' button or the RSS button both found below. Thanks for the chance to win a giveaway! I'd love to get the Nature Walk one. I would love the book on birds! Sorry, my email is edeemarie@yahoo.com. Remarkable Rain looks awesome. All of them, in fact. Thank you for the giveaway. My little girl would love this! We have been doing nature walks since she was 2. These books would make it so much more fun. Wonderful Wildflowers. What a great series of books to teach children about nature! SO many choices! I guess if I had to choose one, it would be the book on conifers. We've been studying them in our co-op and it would be great to have some things to do at home between our meetings. 2lilreds at gmail dot com. Flying creatures of the night looks interesting! We would LOVE to win the Spectacular Spiders NaturExplorer ebook unit!!! We have a list of possible units we are interested in and this one is top on the list. We find many, many spiders in the yard and in the house. Spiders were one of the topics my daughter requested to learn more about this year. I think it is important to tap into those interests throughout the school year. It would be a blessing to utilize this resource during that study. Thank you for the opportunity to win one of these awesome units. If I win, I can be reached at tlm swt 2000 (at) msn (dot) com. I would like to win the bird book. We love nature studies too! It seems we will never stop learning about God's creation:) Fruits and nuts looks great...well they all do- thanks for a giveaway! I'd love the wildflowers book. We would love the wildflowers book or any of them since we have never tried one. It looks good. 100 + Easy and Creative Nature Walks looks like a good one to start with. They all look so good though and that is definitely an area that I need some help in.